FOR years now he’s been the fast talking honcho of the small screen. Considered the icon of hip who raised smart banter into an art form, Javed Jaffery — or simply Javed, as he likes to call himself — who ushered in the era of ad-libbing on Indian television. "It’s my style of presentation. People love my wisecracks," says Javed quite unabashedly. But now the Veejay is himself turning into a successful TV talk show host. And a special one at that. Javed is all ready with this witty bouncers as the host of ESPN’s Super Selector. However, he confesses, for once he’s been caught on a sticky wicket as he doesen’t know much about the willow and the leather. But what he does know a lot about is talking and more talking. Which, the producers have assured him, would quite suffice in this show. And while he shoots his mouth at every boundary that Sachin smashes, his eyes would be glued to another sport — the ongoing World Cup Football series. "Soccer is my love and cricket now is my rozi roti," says he with his trademark glint of the eye. But now with ESPN’s Super Selector, it is his chance to stage a comeback and prove to viewers that though he may not have been very visible for sometime now, his wit and banter and very much intact and he still shoots from the mouth first and makes introductions later. 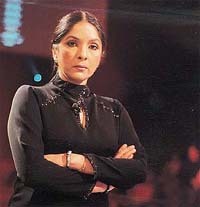 If there is one star who has reaped a golden harvest from the opening of the skies, it is Neena Gupta. Much before Amitabh Bachchan and Ekta Kapoor launched a blitzkrieg on the small screen, she became a household name with serials like Saans and Palchhin. Neena Gupta in Kamzor Kadi Kaun: Star’s weak link? In December, 2001, after a long hiatus, she was back in front of the cameras in a show where her wit and presence of mind were to be her ticket to success. 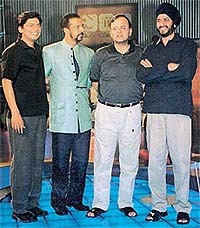 Five months later, Kamzor Kadi Kaun, an adaptation of a popular BBC show The Weakest Link has gone off the air amidst news that its popularity ratings were falling rapidly. Now Neena is back on the planning boards and is said to be working on her pet project — a sequel to Saans. But she is quick to say that nothing concrete has yet been worked out. She has also reportedly been asked by Penguin Books to turn the screenplay into a racy book. And why not? Her sensitive handling of the theme of adultery has always been something to write home about! Even as the channel makes an excellent niche for itself in the comic genre, Sab TV’s production house is not averse to making serials whose themes are anything but funny — as long as it is for another channel. How else can one explain the tear-jerking Kuntee, DD Metro Monday to Friday at 8.30 p.m.? Euphemistically termed a social drama, this party-pooping soap harps on destiny and the havoc it can wreak in some people’s lives. The story revolves around the central character of Kuntee and the cruel games fate plays on her. She’s an ambitious but singularly ill-fated girl who lives with her tyrannical father. 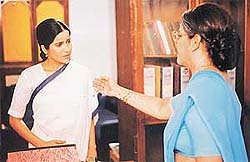 He dislikes her immensely for the sole reason that she resembles her mother whom too he despised with all his heart. Kuntee finds solace in a boy but he too betrays her. Pregnant with his child she finds shelter in a mahila ashram. Her woes are still not over as her child is forcibly taken away by a religious sect on the grounds that she is an unwed mother. Left alone in the big bad world Kuntee has not choice but to take matters in her own hands. She decides to fight back at least for her child. Will she succeed in her battle for the child or will fate deal another losing round for her? Director Gautam Adhikari, known for his action-packed thrillers, seems out of his depths here. But given a theme like that, anyone would be? With the kind of response he gives, he has the makings of a very successful diplomat. But then, as a newcomer who’s got the all-important role of Dr Rahul Mehra in the superhit Star Plus serial Sanjivani, Mihir Mishra wants to play it safe with his answers. Very safe. Question: Why did you replace Gaurav who earlier played Dr Rahul Mehra? Answer: "I don’t know why he left. All I know is I am now playing Dr Mehra. Question: Is your co-star Gurdip Kohil a difficult person to work with? Answer: Not really. With me she’s really wonderful. Question: How is it acting with senior stars like Mohnish Behl? Answer: It’s great. They are all very good people. Very good, no doubt but that doesn’t make a very good interview. C’mon Mihir, say something provocative, something startling. But there’s no tempting this Delhi boy who’s earlier featured in Asha Bhosle’s music video Jab Saamne Tum Aa Jaate Ho and Pankaj Udhas’ ghazal Chandi Jaisa Rang Hai Tera. However, one must give credit to him for doing a fine job in Sanjivani. Changing stars midway is risky business. But such has been the smooth transition that some casual viewers have not even noticed that Mihir is a replacement. Some of the credit goes to the director but most of it must go to the star. And going by the performance he has received for Sanjivani, this real life hotel management graduate has a long innings ahead on TV. It’s action time at Cartoon Network as kicks fly thick and fast with the Indian premiere of Jackie Chan Adventures Wednesday to Friday at 5.30 p.m. 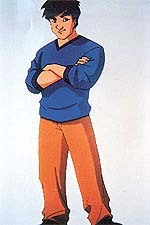 The animated series based on the hugely popular action superhero, Jackie Chan, features him at his martial arts best. Jackie Chan Adventures: Action time on Cartoon Network. In each episode Jackie teams up with his 11-year old niece, Jade, travelling the globe in the hope of locating a dozen magical talismans before a bunch of crooks gets to them. Helping Jackie and Jade is his uncle, an antiquities expert and imperfect wizard who is as cantankerous as he is wise. Though "officially" Jackie works as an expert archaeologist, in reality he also assists Captain Black, leader of a covert police outfit. All 12 talismans Jackie is after have mystical qualities and each represents a sign of the Chinese zodiac. A sinister gang led by Dark Hand is after them and so is Jackie. Watch the series to see who gets them first. As a bonus, Jackie will be featured in live-action segments within the main title and body of the series. He’s also provided the voiceover for the show. So kids, don’t miss out on this adrenaline-pumping series that’s as exciting to watch as a Jackie Chan moive. They are the bravehearts who go after daunting challenges. Not for them the ordinary humdrum lives. They would go to any length to seek the truth and bring succour in the midst of hopelessness. They are The Men of Action who may live in different parts of the world but have a startlingly similar mission — to pursue truth. The series starting on the National Geographic Channel, June 17 at 9 p.m., showcases the ultimately inspiring stories of seemingly ordinary people who do extraordinary things. They move out of the cozy, familiar confines and explore unknown areas. The series celebrates the courage and enterprise of these seekers who have brought about a better understanding of the world and everything in it. The first in the series on June 17 is the story of Hayden Turner, who travelled to war-torn Afghanistan on a mission of mercy to save the animals at the Kabul zoo. Working hand-in-hand with international relief workers, Turner, a former zookeeper, helps to relocate animals in danger and works to enhance their desolate living conditions. But Hayden Turner is not the only one. There are plenty more people who do amazing work in the face of danger — and even death. Don’t miss this fascinating series of people who triumph against all odds. As part of Star TV’s plan to establish a new news channel in the present competitive environment, Star News has got a new News Director in Sanjay Pugalia. He has earlier worked with the Times of India group, Business Standard, Aaj Tak, and is currently with Zee News as Executive Editor. With the border situation in a state of flux and the news channels vying with each other to keep viewers hooked, this change of guard may be significant for Star TV.